In 1-quart saucepan, mix 1/4 cup granulated sugar and the cornstarch. Stir in water and egg yolks with wire whisk until well mixed and no lumps remain. Heat to boiling over medium heat, stirring constantly, until mixture begins to thicken. Cook and stir 1 minute; remove from heat. Stir in 1 tablespoon lemon peel and the lemon juice. Refrigerate uncovered 20 minutes, stirring once, until room temperature. Heat oven to 350°F. Grease bottom and side of 9-inch springform pan with shortening; lightly flour. In large bowl, beat butter and 1 cup granulated sugar with electric mixer on medium speed about 1 minute or until smooth. Beat in eggs, one at a time, until just blended, then continue beating on medium speed 2 minutes, scraping bowl once. 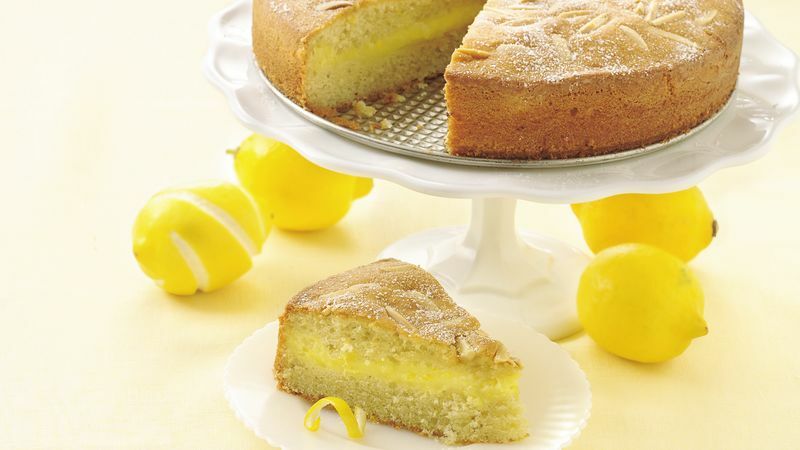 On low speed, beat in flour, 2 teaspoons lemon peel, the baking powder and vanilla about 30 seconds or until just blended. Spread half of cake batter (about 2 cups) in bottom of pan. Spoon custard evenly onto batter, spreading to 1/2 inch of edge. Drop remaining batter by tablespoonfuls around edge of custard and pan. Spread batter evenly and toward center to cover custard. Sprinkle almonds over top. Bake 45 to 55 minutes or until center is set, cake is firm to the touch and top is golden brown. Cool in pan on wire rack at least 1 hour (center will sink slightly). Run thin knife around side of cake; remove side of pan. Sprinkle with powdered sugar before serving. Serve warm or cool. Store covered in refrigerator. *To toast almonds, bake uncovered in an ungreased shallow pan at 350°F for 6 to 10 minutes, stirring occasionally, until golden brown.